This product is now NOT AVAILABLE on Amazon. Please refer to Actron CP9690, which is much better than CP9680. Read my Review of Actron CP9690 HERE. 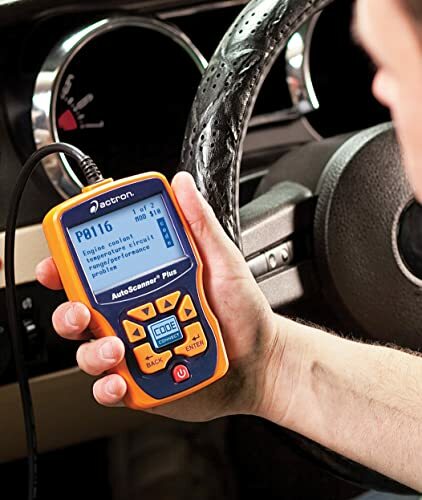 The Actron CP9580A enhanced auto scanner plus is one of the best OBD scan tools in the market. The option to provide a customizable live data feed is one of the best attributes of this scan tool and this allows it to provide up-to-date data cones. This will speed up the overall process of fixing issues that affect your engine. The playback option will allow you to retrieve previous data from the vehicle. The code connects feature will make Actron Autoscanner plus CP9580 easier for the technicians to be able to figure out the areas that are faulty. The auto scanner is compatible with CAN and OBD2 motor vehicle engines. The CodeConnect feature will allow the device to pinpoint where the fault is and give the ideal solution, which has seen it provide over 4 million fixes, globally. The Actron CP9580A has a custom data list for the live data as well as graph live data. There are support features which include drive cycle mode state OBD check, print data support, and freeze frame data. The scan tool is compatible with 1996 and new Can and OBD II vehicles. Actron CP9580 scan tool will provide ABS code coverage, on-screen graphing, and record and playback data stream. The trilingual support and generic specific code definitions are the main forms of support offered by the manufacturer. The Actron CP9580A enhanced auto scanner plus has AAA dry cell batteries, which make it possible to operate the device independently, without connecting it to the vehicle. User-friendly features – at only 1 pound, this scan tool is among the lightest ever. This alone allows the user to enjoy stress-free use of the tool. Longevity – with the ability of the Actron CP9580A to be updatable, it is possible to use this tool over longer periods of time. The Actron CP9580A enhanced auto scanner plus is an advanced scan tool that is ideal for professional technicians as well as those who love DIY processes. In order to use this device effectively, you should ensure that all the connectivity cables are available. The main accessories include OBD II cable, USB cable and an 8-foot extension cable. Use the cables to connect to the vehicle and PC if you need to print the data. The device has 3 main languages, which makes Actron CP9580A easy to follow the instructions and use Actron CP9580 scan tool effectively. If you are not familiar with the device, you can get a technician to help you in the diagnosis. Just like any other device, the Actron CP9580A enhanced auto scanner plus require frequent maintenance so as to enhance its performance. The scan tool can be updated using the USB cable and a Windows computer. Get all the latest updates, which will facilitate the process of code reading. The instant messaging mechanism will be able to notify you when the device needs an update. This is one of the most efficient scan tools that does not harm the environment in any way. There are so many OBD II scan models that have been introduced in the market. However, the Actron CP9580A enhanced auto scanner plus is one of the models that has so many benefits and very few drawbacks. The device is very easy to use, considering the fact that it relies on a plug and plays technology. This is the same way that you will be able to update it, through your PC, using the USB cable. In as much as the scanner seems to work with OBD I, OBD II and CAN engines, it seems to be excellent when it comes to OBD II protocols. This may be the right auto scanner tool for your vehicle, but Actron auto scanner plus cp9580 is also advisable to shop around and compare what the other models in the market have to offer. This will help you in making an informed decision in regards to the diagnostic tool to purchase for your vehicle.